In the afternoon of February 10, 2015, at King Long Guannan Industrial Zone, Chinese bus industry leader King Long and the global auto parts giant supplier ZF Group signed a strategic cooperation framework agreement that the two sides formally become a global strategic partnership, Which marks the King Long’s substantive progress in implementation of the global cooperation strategy. 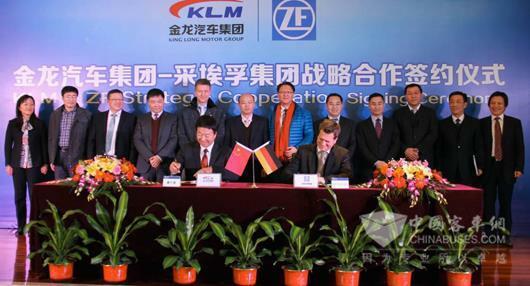 Mr. Lian Xiaoqiang, the president of FJMOTOR and King Long, and Staedtler, president of ZF commercial vehicle representing the two sides signed the strategic agreement. Mr. Lian said, the group will continue to deepen the comprehensive, integrated work goal, with the hope that cooperation between the two sides is not only the product purchase, but also joint research and development of new technology. ZF is a global player in driveline and chassis technology with 121 production companies in 26 countries. The Group is among the top 10 companies on the ranking list of the largest automotive suppliers worldwide. 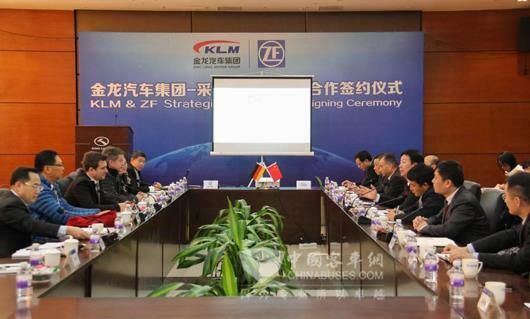 As one of the ZF largest customers in bus industry in China, King Long has been in partnership with ZF for decades. The sign of the strategic cooperation framework agreement poses an positive influence on the automobile industry of Fujian province and even Chinese bus industry to improve global competitiveness.